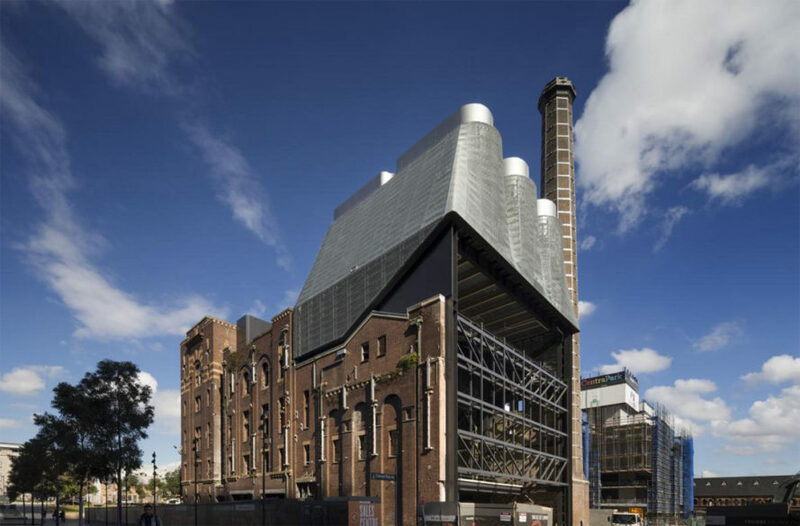 Want to see the world's best new buildings? Look no further than the 2016 World Architecture Festival Awards, which feature 343 spectacular, innovative, and inspired projects from 58 countries. We've rounded up the best of the best - from a mountainous green-roofed apartment complex to the world's first 3D-printed office and a beautiful butterfly pavilion wrapped in a shimmering facade. 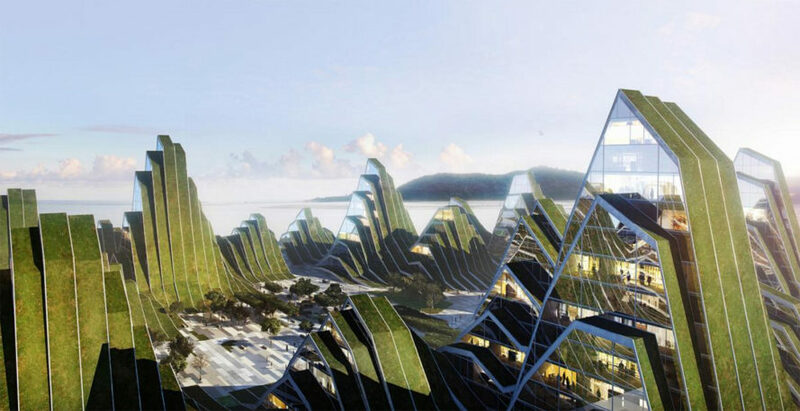 BIG’s Hualien Residences in Taiwan are mountainous structures covered in landscape strips that bring the mountains to the beach. The project hopes to encourage a healthy lifestyle for the complex’s elderly residents with walking paths and underground jogging paths. Green roofs minimize heat gain and the landscaping strips help to block the most intense sun of the day. The project is still in progress and has already been nominated for the 2014 MIPIM Awards. The Community Center in Poggio Picenze by Burnazzi Feltrin Architetti was built to replace a building damaged in a 2009 earthquake in Italy. The center honors the characteristics of the original building while adding modern elements that make it a nature-inspired social space. The building is covered in larch wood with a green roof in a zig-zag shape that evokes the cracks caused by the earthquake. 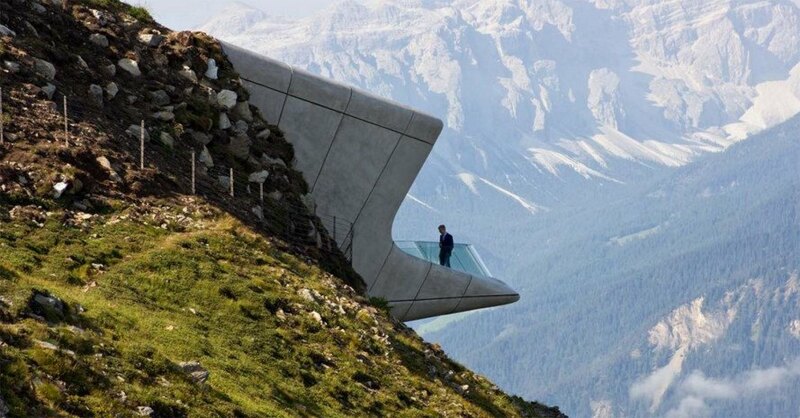 Set on a steep mountainside in Corones, Zaha Hadid’s dramatic Messner Mountain Museum resembles a Bond villain lair. But the mountaintop museum is actually a stunning space where people can learn about mountain geology, traditions and culture – all at an astonishing 7,500 feet above sea level. The museum actually tunnels through the mountain, with one volume emerging out of the mountain’s face. 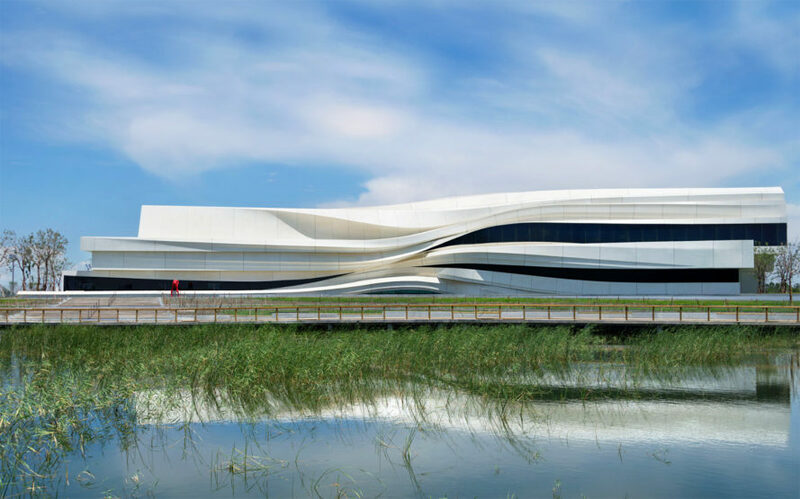 The Art Museum in Yinchuan, China evokes the flowing lines of the Yellow River. 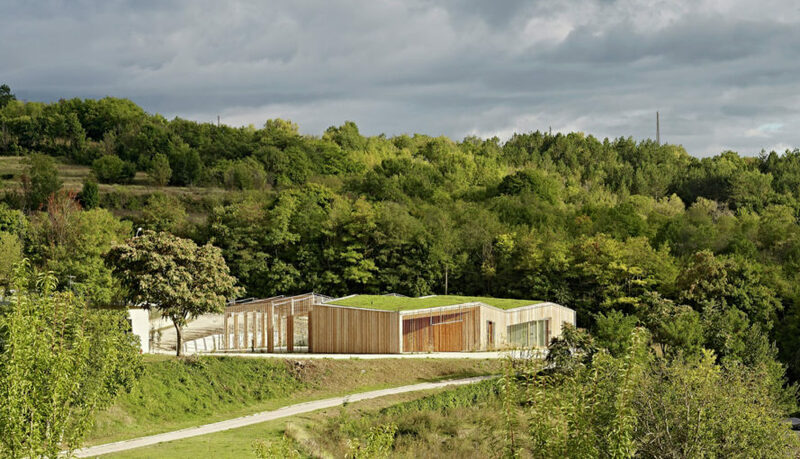 We Architect Anonymous wanted to highlight the local environment and the river’s rich ecological history by giving the building a layered aesthetic inspired by the surrounding hills and river. To accomplish this, WAA used glass fiber-reinforced concrete. 3deluxe created the whimsical butterfly pavilion as a home for over 500 butterfly species. A golden façade made out of 4,000 aluminum leaves covers a glass cube, helping to regulate the interior climate while evoking the look of butterflies in flight. This year, Killa Design, along with Gensler, created the world’s first fully 3D-printed office. Dubbed the Office of the Future, the building was assembled in just 17 days and comes with all the amenities needed for a comfortable, safe work environment. It also happens to save 50 percent on labor costs, which proves that the future of construction is going to be pretty incredible. Zaha Hadid’s modern extension at the University of Oxford provides the perfect counterbalance to the school’s Victorian-era buildings. The reflective volume meanders through the campus and around an existing sequoia tree, changing height and width to accommodate the buildings around it. Foster + Partner’s Maggie’s at the Robert Parfett building is a place where people impacted by cancer can find peace and refuge. The design was created to “lift the spirits” and help people heal with natural light and plenty of greenery. Sliding glass doors let the outside in, and an airy, glass exterior brings the healing properties of sunlight into the space. The hospital can also use the space to grow flowers and produce for patients. 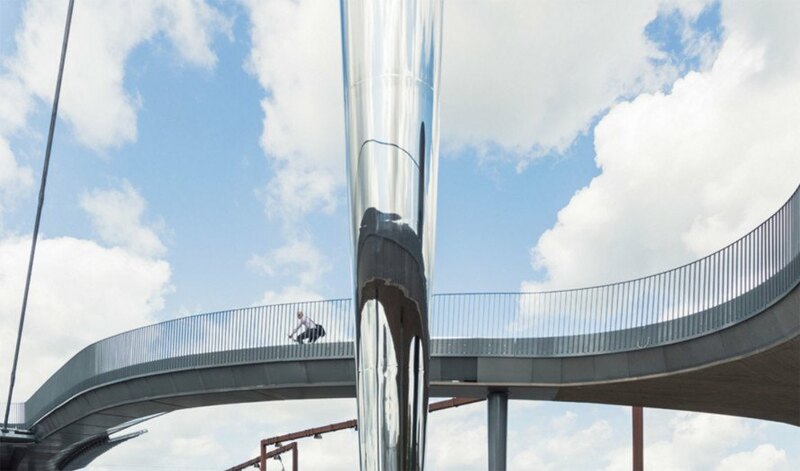 Gottlieb Paludan Architects’s Byens Bro bridge is an elegant solution that lifts pedestrians and cyclists above the railway tracks at Odense’s train station. The bridge’s sweeping lines and streamlined aesthetics frame it as a natural part of the urban landscape. 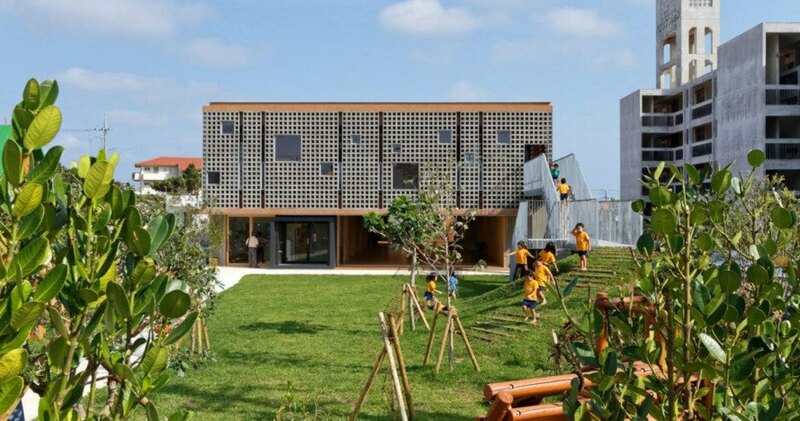 Located on a Japanese island 250 miles off the coast of Taiwan, Hanazono Kindergarten is a beautiful building design by Hibinosekkei + Youji no Shiro to withstand the region’s dangerous typhoons. The building’s facade is made from steel-reinforced concrete blocks with hollow centers that allow light to filter into the school. Crossrail Place is a seven-story train station topped with a flourishing garden in London’s Canary Wharf. The project’s most remarkable feature is its 1,000-foot timber awning, which is studded with triangular ETFE cushions that allow light to filter down to the the plants below. 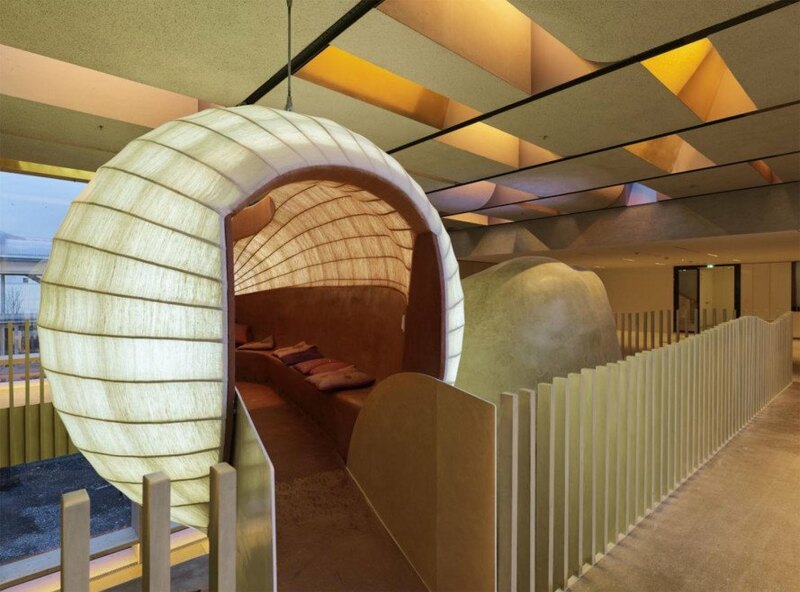 Get ready for a serious case of office envy. Dietrich | Untertrifaller’s Omicron Campus is an amazing workspace filled with luminous pods, copious daylighting, and a show-stopping sculptural wood staircase that stretches from one story to the next. Located in Gangnam-gu, Seoul, Shinsegae International is a 15-story skyscraper topped with a vibrant roof garden. Olson Kundig designed the project to provide office and retail space for South Korea’s oldest and largest importer of luxury fashion. Zaha Hadid's Messner Mountain Museum Set on a steep mountainside in Corones, Zaha Hadid's dramatic Messner Mountain Museum resembles a Bond villain lair. But the mountaintop museum is actually a stunning space where people can learn about mountain geology, traditions and culture - all at an astonishing 7,500 feet above sea level. The museum actually tunnels through the mountain, with one volume emerging out of the mountain's face. The 3D-Printed Office of the Future This year, Killa Design, along with Gensler, created the world's first fully 3D-printed office. Dubbed the Office of the Future, the building was assembled in just 17 days and comes with all the amenities needed for a comfortable, safe work environment. It also happens to save 50 percent on labor costs, which proves that the future of construction is going to be pretty incredible. BIG's Hualien Residences BIG's Hualien Residences in Taiwan are mountainous structures covered in landscape strips that bring the mountains to the beach. The project hopes to encourage a healthy lifestyle for the complex's elderly residents with walking paths and underground jogging paths. Green roofs minimize heat gain and the landscaping strips help to block the most intense sun of the day. The project is still in progress and has already been nominated for the 2014 MIPIM Awards. 3deluxe's Butterfly Pavilion 3deluxe created the whimsical butterfly pavilion as a home for over 500 butterfly species. 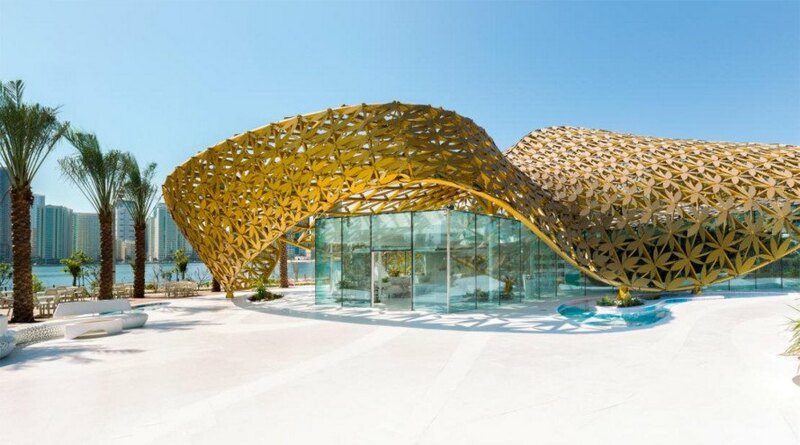 A golden façade made out of 4,000 aluminum leaves covers a glass cube, helping to regulate the interior climate while evoking the look of butterflies in flight. WAA's Yellow River Art Museum The Art Museum in Yinchuan, China evokes the flowing lines of the Yellow River. We Architect Anonymous wanted to highlight the local environment and the river's rich ecological history by giving the building a layered aesthetic inspired by the surrounding hills and river. To accomplish this, WAA used glass fiber-reinforced concrete. Burnazzi Feltrin's Community Center The Community Center in Poggio Picenze by Burnazzi Feltrin Architetti was built to replace a building damaged in a 2009 earthquake in Italy. The center honors the characteristics of the original building while adding modern elements that make it a nature-inspired social space. The building is covered in larch wood with a green roof in a zig-zag shape that evokes the cracks caused by the earthquake. 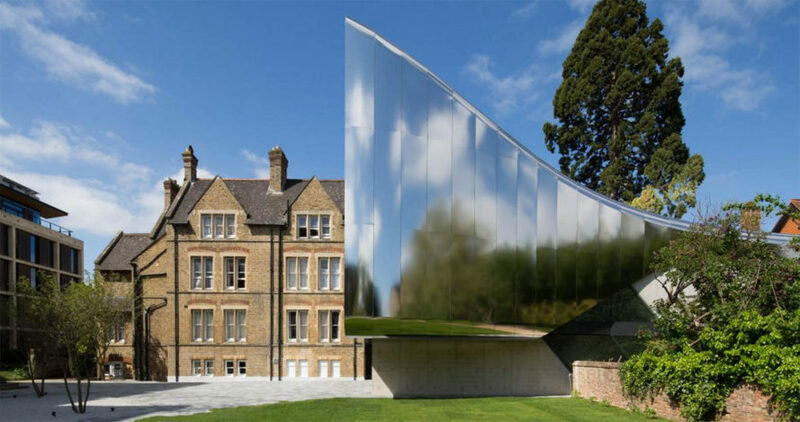 Zaha Hadid's modern extension at the University of Oxford provides the perfect counterbalance to the school's Victorian-era buildings. The reflective volume meanders through the campus and around an existing sequoia tree, changing height and width to accommodate the buildings around it. Maggie's at the Robert Parfett Foster + Partner's Maggie's at the Robert Parfett building is a place where people impacted by cancer can find peace and refuge. The design was created to "lift the spirits" and help people heal with natural light and plenty of greenery. Sliding glass doors let the outside in, and an airy, glass exterior brings the healing properties of sunlight into the space. The hospital can also use the space to grow flowers and produce for patients. Foster + Partners' Crossrail Place Crossrail Place is a seven-story train station topped with a flourishing garden in London's Canary Wharf. 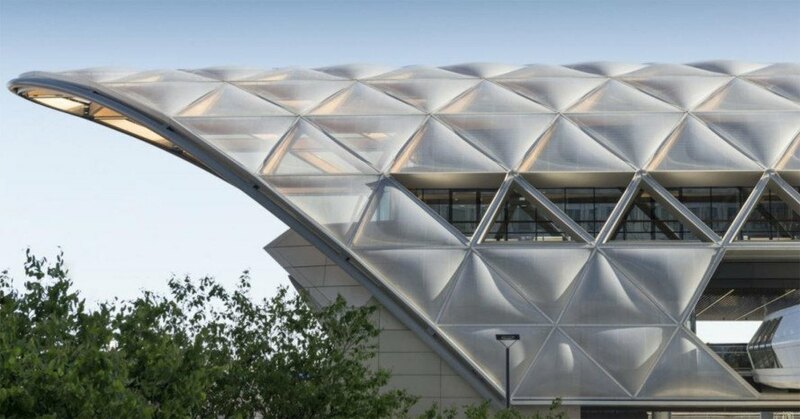 The project's most remarkable feature is its 1,000-foot timber awning, which is studded with triangular ETFE cushions that allow light to filter down to the the plants below. Byens Bro Cycling Bridge Gottlieb Paludan Architects's Byens Bro bridge is an elegant solution that lifts pedestrians and cyclists above the railway tracks at Odense's train station. The bridge's sweeping lines and streamlined aesthetics frame it as a natural part of the urban landscape. Hanazono Kindergarten Located on a Japanese island 250 miles off the coast of Taiwan, Hanazono Kindergarten is a beautiful building design by Hibinosekkei + Youji no Shiro to withstand the region's dangerous typhoons. The building's facade is made from steel-reinforced concrete blocks with hollow centers that allow light to filter into the school. Omicron Campus by Dietrich | Untertrifaller Get ready for a serious case of office envy. Dietrich | Untertrifaller's Omicron Campus is an amazing workspace filled with luminous pods, copious daylighting, and a show-stopping sculptural wood staircase that stretches from one story to the next. Shinsegae International by Olson Kundig Located in Gangnam-gu, Seoul, Shinsegae International is a 15-story skyscraper topped with a vibrant roof garden. 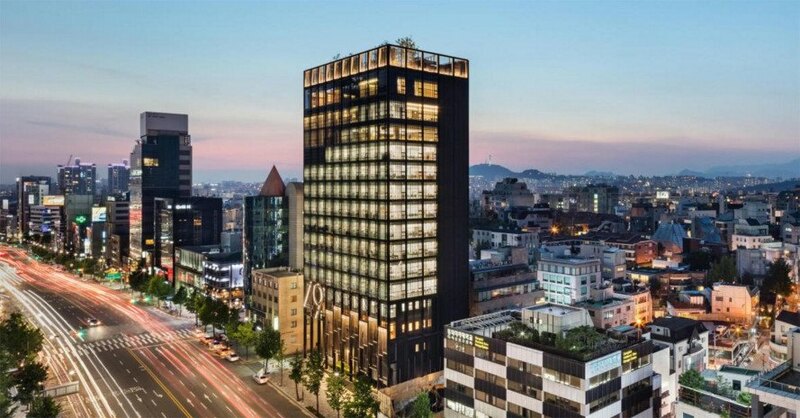 Olson Kundig designed the project to provide office and retail space for South Korea's oldest and largest importer of luxury fashion.